Can the Blitzkrieg be stopped? Across the Dnepr: Second Edition revisits a classic on a new system. Created from the ground up as an expansion for SSG’s latest acclaimed game engine, Kharkov: Disaster on the Donets, the Second Edition of Across the Dnepr includes Areas of Operations, the latest AI programming and multiple Mystery Variants to keep gamers guessing. Multiple scenario variants to keep gamers guessing - choose to fight a scenario historically or choose to randomize the variants to keep things unpredictable! A new (and brutal) unit is now available, Russian NKVD, which can be used to prevent other units from retreating! 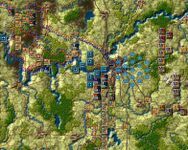 Across the Dnepr: Second Edition is an expansion and requires Kharkov: Disaster on the Donets in order to play.